It’s almost summer in beautiful, downtown Melbourne and time for Greedy Girl and gluttonous husband to throw off the heavy coats and embrace a special part of the world, their balcony that overlooks the city. Perched on high stools, our favourite pastime in fine weather is to open a bottle of something nice and enjoy some snacks as the sun goes down and the lights of the city come on. One of gluttonous husband’s recent creations is in particular demand – spring onion pancakes. It seems a little counter-intuitive to offer this sort of recipe as the mercury rises, particularly as working with pastry in warmer months can be tricky. Gluttonous husband takes a huge part of the complexity away with this recipe by using dumpling wrappers bought from the local Asian supermarket and stored in the fridge, ready to use. These little rounds are so perfect, and convenient, Greedy Girl wonders whether anyone would really bother making their own (unless they’re a Chinese chef, of course). 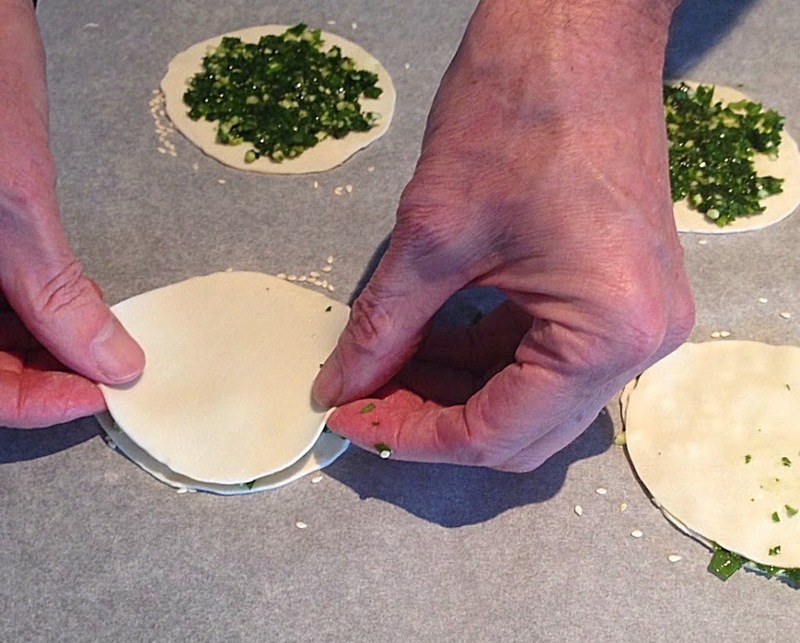 We’ve had spring onion pastries as part of dim sum in a lot of Chinese restaurants. This is a much less stodgy version and perfect for vegetarian friends. 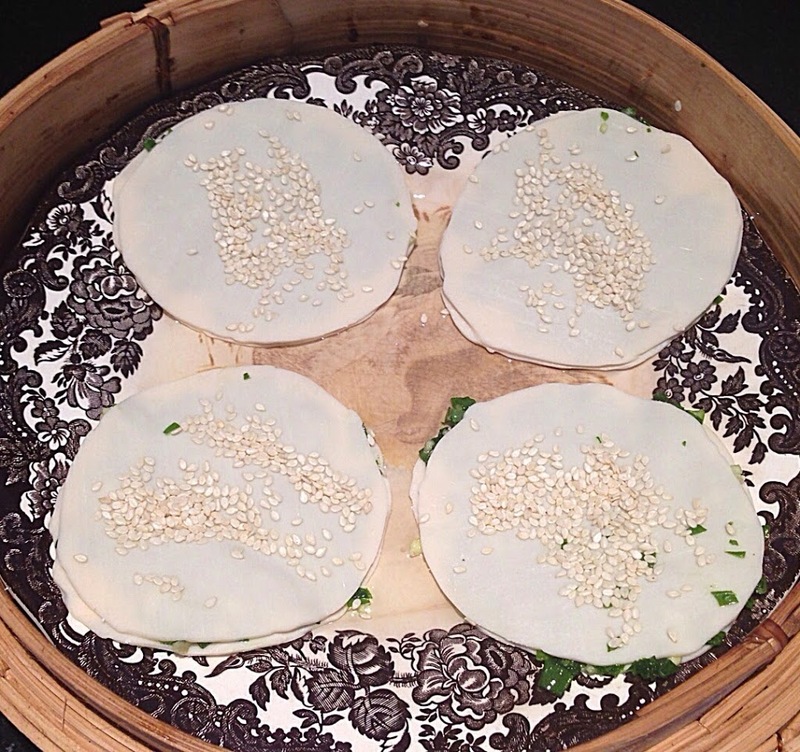 The wrappers are made from wheat flour, starch, vegetable oil and salt so may even qualify as vegan. The key to getting a crispy result is using two cooking processes – steaming and frying. Having said that it’s far from complicated or time consuming. 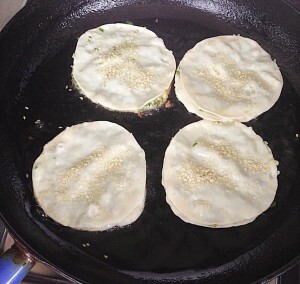 This recipe is to make four pancakes (as pictured above) but obviously you can make as many as you need. Greedy Girl isn’t going to say ‘as few’ as you need because they’re intensely more-ish. 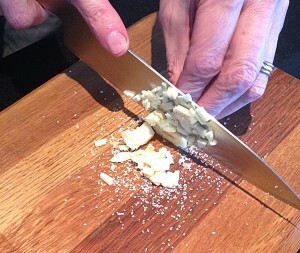 Finely chop the garlic with a little salt on the chopping board. This soaks up any juice that comes out of the garlic and makes a nice paste. 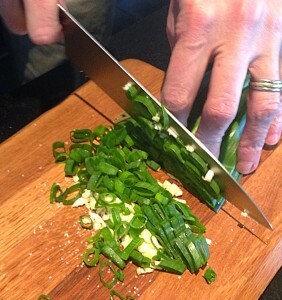 Slice the green parts of the spring onions and combine with the garlic. Place a square of baking paper on your benchtop. 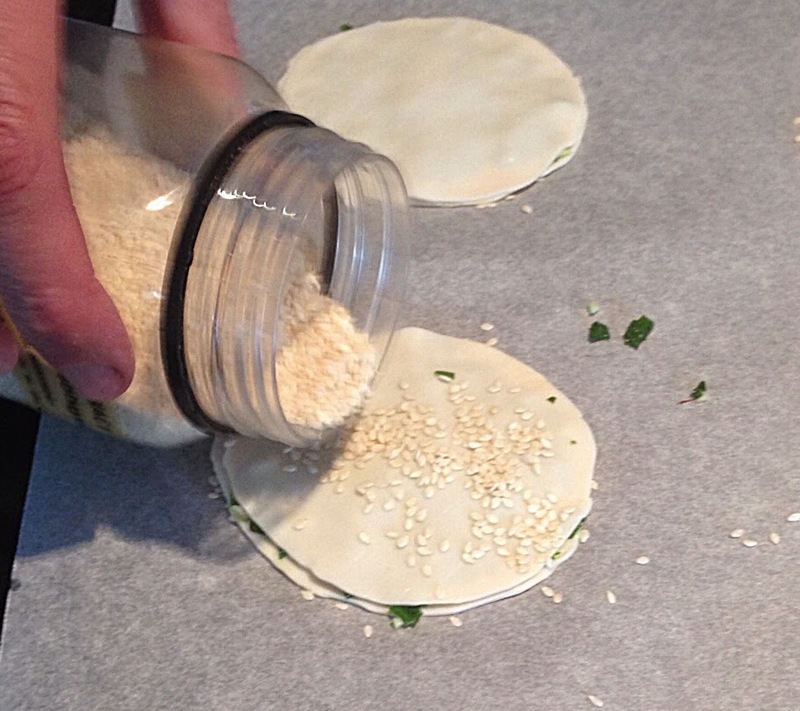 Sprinkle some sesame seeds in a shape that mimics that of your dumpling wrappers. 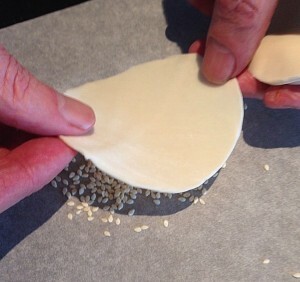 Place a wrapper on top and press firmly down on the seeds. 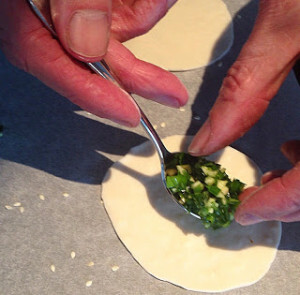 Place a small spoonful of the onion and garlic mixture in the centre of each wrapper. Flatten the filling and spread a little. Put another wrapper on top and press down (the filling will flatten more). Sprinkle some more sesame seeds on the top wrapper. 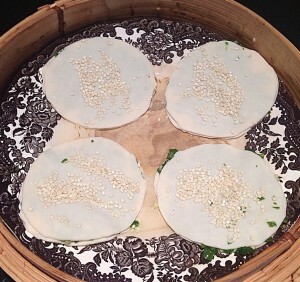 Place the completed pancakes in a single layer on an oiled plate inside a steamer (these fit comfortably in our size steamer but you may need to do these in batches, depending on the size and quantity you’re making). We place the steamer on top of simmering water in a wok. The pancakes steam for six minutes. It’s then time to shallow fry them. You don’t need a lot of oil (vegetable, canola), just make sure the base is covered. 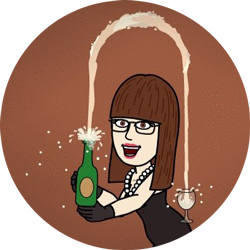 A couple of millilitres will suffice, but make sure the oil is hot before you place the pancakes in. Fry until golden brown, so just a couple of minutes each side. Watch that they don’t burn. Don’t worry if the top wrapper curls up a little or the edges come apart – the filling won’t fall out. If you’re cooking in batches, you can put them in a very low oven (about 60 degrees celsius) to keep warm. Cut them into wedges and serve with a dipping sauce, made by combining equal parts of light soy sauce, rice wine vinegar and a dash of sugar. Just whisk quickly to dissolve the sugar. And you’re done! 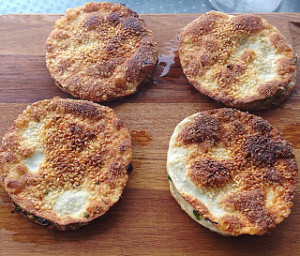 These crispy little delights work particularly well with a glass of bubbles or a beer.